Miss Wits Varsity Cup relaunches by shifting the focus to social awareness. 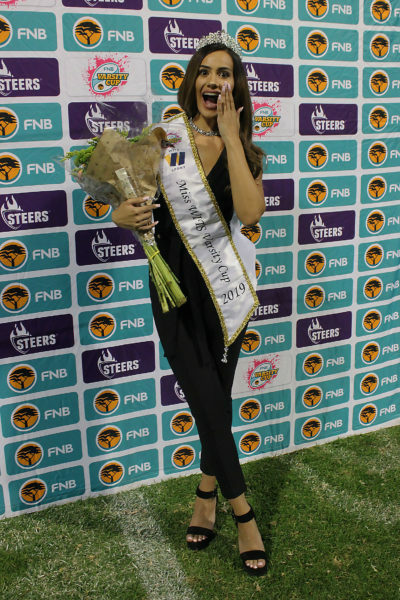 A first year education student has won the 2019 Miss Wits Varsity Cup competition on Monday, March 25 at the Wits Rugby Stadium. Reo Brydges was announced as the winner beating out first princess, Lerato Josephs, first-year BA student and second princess Nomfundo Ngubane, a fourth year BSc student. Brydges, a BEd student, said she is excited to represent the university and will use her title to get more involved with the Princess of Charlene of Monaco Foundation – an organisation that aims to end drowning. “It’s not just about looks,” said the 20-year old. “This platform gives me the opportunity to change lives [and] to make a difference in the community,” Brydges said. The competition which did not take place in 2018, included a focus on health and fitness this year through the inclusion of activities such as hiking. Brydges told Wits Vuvuzela that the fitness activities were understandable as “this is about rugby” … “but first and foremost this is about the charity and creating awareness”. Varsity Cup manager Xhanti-Lomzi Nesi said that through the relaunch they wanted to create more of an ambassadorial role focused on “more social awareness”. However, Nesi said students were concerned that “if they [Varsity Cup] change it too much they will be replicating the Student Representative Councils, making the tournament redundant and unrecognizable”. “The Miss Wits Varsity Cup competition is not a conventional pageant,” said, Nandi Buthelezi Wits Sport’s marketing assistant. “Although voting plays a big role in the competition … we also look at their [contestants’] personalities and see how they engage with the other ladies in the competition. Brydges won a cash prize of R2000 with her title which she received during the halftime of the FNB Wits vs FNB UWC Varsity Cup rugby match.